I found this recipe in Fine Cooking magazine a number of years ago and it has become a favorite of ours. I usually make it with crab cakes because they both can be prepared ahead of time and they both cook quickly. This dish is essentially a baked version of fettuccine alfredo; you can’t help but notice the similarity when you take the first bite. Heat the oven to 500°F (yes 500). In a large pot, bring 3 quarts of water to a boil. Undercook the pasta slightly so that it’s a bit toothier than al dente, 1 to 2 minutes less than the package directions. Drain well. Add 1/4 teaspoon salt and pepper to taste, then add cream and cheese (reserving 2 Tablespoons). The recipe calls for individual ceramic gratin dishes, but I put mine in a casserole dish. Add butter. It can be made ahead to this point. Bake until the pasta is bubbly and hot and the edges begin to brown, about 10 minutes. If using one larger dish it might take 5 minutes more. Don’t overbake or the sauce may separate. Let rest for 3 to 5 minutes before serving. I hope you enjoy this pasta dish. Every time I serve it I am asked for the recipe. PS. Like I said above it is a great side dish to crab cakes. We also like serving pretzel rolls with it. 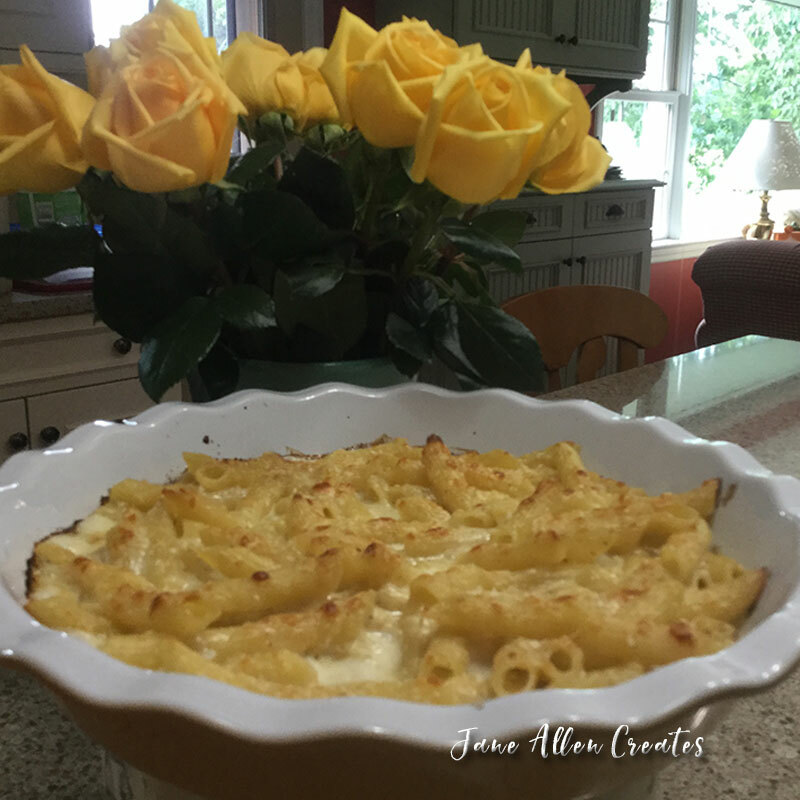 This is a recipe I tried recently and was a big hit w/ guests! Thought you might like to give it a whirl! In a large bowl, whisk flour, salt and yeast until well mixed. Pour in warm water and use a wooden spoon to stir until a shaggy dough forms. The mixture will be wet and very sticky to the touch. Cover bowl tightly with plastic wrap and set aside in a warm place 8 to 18 hours until dough rises, bubbles and flattens on top. Heat oven to 450 degrees F. Once oven is preheated, place a 6-quart Dutch oven (with cover) in oven 30 minutes before baking. Punch down dough. Generously flour a sheet of parchment paper; transfer dough to parchment and, with floured hands, quickly shape into a ball. Place dough on parchment paper and sprinkle top lightly with flour. Top with a sheet of plastic wrap and let rest 30 minutes. Remove Dutch oven from oven. Uncover dough and carefully transfer to Dutch oven, with or without parchment paper beneath (if bottom of Dutch oven is not coated with enamel, keep parchment paper beneath dough). Cover Dutch oven and return to oven. Bake bread 45 minutes covered, then another 10 to 15 minutes uncovered until dough is baked through and golden brown on top. Cool slightly before slicing. Thanks Nancy, I will have to try it. Do you ever add vegetables to it? I have not. Not sure if you would have to do some pre cooking, guess it would depend on the veggie. Let me know how it works out. Thanks Amy, it is yummy and easy, and fast.